Just wanted to say a quick hello to any APW readers who have made their way over. Welcome! Thanks for stopping by. Rarely do I read a book that leaves me speechless. I just finished Unbroken: A World War II Story of Survival, Resilience, and Redemption, the epic novel about WWII POW’s, centered around the life of Louis Zamperini. I’m not much for historical novels, much less biographies, but since I was home sick over a three-day weekend, I started it thinking it would be a great way to pass the time and enjoyed the chapters on Louis’ childhood and olympic dreams in between catching up on shows with my Hubbs. Then I made the mistake of starting the section where their plane went down just before bed. At 3:36 am I put the book down with the war over and Louis not yet having met his love. I literally couldn’t stop reading until the POW’s were home safe. There really are no words to describe this book. I could go on about the struggle, the triumph of the human spirit, humanity’s capacity for great acts of cruelty and even greater acts of forgiveness, but it all sounds hollow to my ears. Instead I’ll relay the recommendation that prompted me to pick up the book in the first place. Last month my therapist came to speak at an event at our church about confidence. During her talk she remembered hearing Loius Zamperini speak and being captivated by the man’s wit, humility, and deep, abiding faith. When talking about Unbroken, the woman who has recommended more books to me than I can name and always had a new book on her desk when I saw her said it may be the best book she’s ever read. And I agree. We’re living in a time where we don’t go to war, but take ‘military action.’ We’re coming up on a time when the last survivors of major wars will no longer be with us. In junior high, my school had a long-standing arrangement with a local married couple, the Rosenburgs, who came in once a year to talk to the seventh and eighth graders about surviving the Holocaust. Both were Jewish prisoners in Nazi concentration camps. Mrs. Rosenburg spoke to the seventh graders, having spent only a little while in one of the ‘softer’ camps, while Mr. Rosenburg spoke to the eighth grade students about his almost two years in the camps and being convinced that he would die there, like the rest of his family before him. At the end of his imprisonment he was told that he would be executed in two days time. That was the day the Nazis surrendered. They came to talk to us so that we might understand the importance of remembering the past so that we can choose a better future. Even us self-centered kids knew that we were experiencing something important, and I remember thinking that my children would never have the experience of hearing these stories firsthand. It’s for this reason I am deeply grateful to Laura Hillenbrand for immortalizing a story that should not be forgotten. As different areas of Japan were named in the book, I thought about how different the country looks now from the way it was described in WWII. Just sixty-seven years later. A lifetime to us, but a tiny drop in the bucket that makes up humanity’s history. As I read about the atrocities visited on Allied POW’s in Japan, I felt a strong burden to remember that the horror went both ways. I’ve visited ground zero at Hiroshima twice. Once in 2001, and again in 2008 with A. If it were only me in Japan that second time, I probably wouldn’t have chosen to visit the memorial or walk through the museum again. But I firmly believe that it’s something that every American lucky enough to visit that beautiful country should experience, so I took A. He was as overwhelmed, as overcome as I had been at seventeen. I remember the first time I walked through the museum at the Peace Plaza; I was pretty ignorant about the war. I knew we hadn’t started it, but that we had been the ones to end it. Seeing how we ended it was startling, shocking, appalling. I was afraid that every Japanese person around me was looking at us touring Americans and blaming us for what happened. But as I walked through, reading accounts of the war and the bomb that ended it all, I was struck by the common theme that was expressed over and over again on those walls – one of contrition, forgiveness, and a desire for abiding peace. 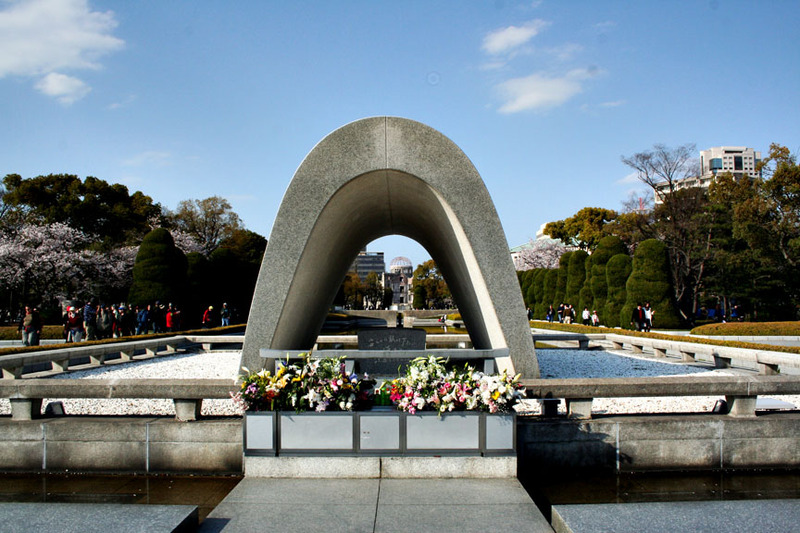 hiroshima peace memorial park in 2008. you can see the a-bomb dome in the distance through the memorial cenotaph. The Peace Memorial in Hiroshima, where a bombed-out building still stands at ground zero, is a testament to the destructive nature of war. Unbroken tells the stories of lives that were destroyed, families ripped apart, and futures stolen by war. We truly live in a broken world, one I believe will not be redeemed until Christ comes to bring as all home, but I pray that war may be avoided and that stories like Louis Zamperini’s and the Rosenburgs are among the last of their kind. And so we read, we listen, we remember. And we move forward.